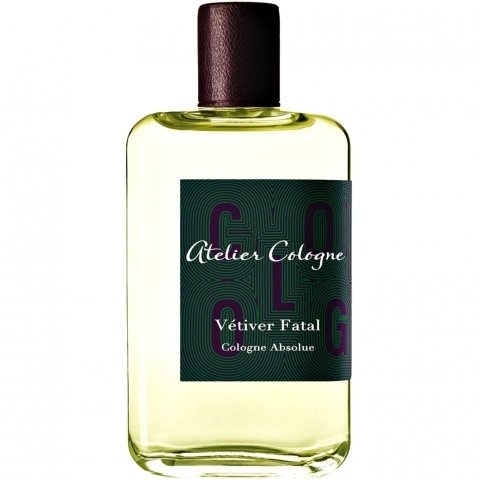 Vétiver Fatal is a perfume by Atelier Cologne for women and men and was released in 2012. The scent is fresh-green. It is being marketed by L'Oréal. At the beginning of the day you can taste typical citrus fruits from this house, then the vetiver with the plum take the body of the perfume until the end. It is not the typical vetiver spicy and green, if not fresh, fruity, we could say that it is a different vetiver but good for the beginnings in this note. Good longevity and good projection. Vetiver Fatal by is a wonderfully sweet, plummy vetiver. It's not dry or too harsh like a lot of other vetiver fragrances, instead it's lush and sweet and fruity. Very nice! It opens with a beautiful mix of citrus and violet leaf, giving a very "wet" impression, but is swiftly joined by a very sweet, juicy, almost "stewed" plum accord. The use of plum here is very nice as I don't see this note a lot in fragrances. It combines with the vetiver and stops it becoming too dry or too green. The greenness is still there, but it's sweeter (like a sweet, ripe plum), and in no way is it artificial. Basically the impression I get is of a field in May where plum trees are growing nearby, and you can smell the grass and earth and hay, before going over to the tree and picking the fruit, which is full of (natural) sweetness, no artificial sugar, just a pure natural one... and it's like closing your eyes and smelling the plum, before putting it in your mouth and tasting the sweetness. This is the impression I get from this one. The smells of the sweet fruits of nature. I think that maybe if you dislike very sharp, green fragrances and are looking for something a little "sweeter", then try this one out. I also think that if you have been trying vetiver fragrances and didn't find the right one for you, then give this one a try. I think that even a vetiver lover would like this one as it is a very playful, casual fragrance, but which can be worn in formal occasions too (basically anywhere). A lovely fragrance which reminds me of nature at it's finest. Good stuff! Vetiver Fatal. The images that spring to mind are quite like those offered by the sample postcard: a silver pistol, leather gloves, film noir, high-end writing instruments -- aggression and a timeworn class. And that's how it begins, with the confident, rooty, earthen aroma of vetiver. Then waddles in a baby, shining head-to-toe with the sheen of baby oil. No, you have not wandered into outtakes from a David Lynch movie; instead you have just experienced the not-so-beautiful letdown of Vetiver Fatal. Baby oil does not connote anything fatal, unless you believe that the marriage bed is the grave, but to quote James Joyce is how far you have to stretch to make this association work. Baby oil is the wrecking ball, and it dominates the vetiver, laying waste to it until a third incongruous element appears: a soapy-citrus accord. Maybe the grimy detective feels the need to eat a peach, and then take a bath after his long hard day pounding the pavement and taking odd cases from femme fatals? The name of this fragrance is accurate in one way -- it slayed me with a maul of disappointment. Longevity is eight hours, and silage is average, at a foot or so. Vetiver Fatal is somewhat a fruity vetiver. This scent has a wonderful development in my skin. Opens with a blast of citric tones with a sweet plum note that remains for about 1 hour. Then it slowly turns into a fresh vetiver, that's in the middle of Tom Ford's Grey Vetiver and Sycomore. Not very sweet, neither so dry, but actually a creamy vetiver. Also Vetiver Fatal is far away from those dark vetiver scents like Encre Noire and Guerlain's Vetiver Extreme. It's a very well balanced blend, with medium sillage and soft projection. Deserves at least a try. Say what you will, but I'm a gal who can really appreciate a good vetiver frag. Atelier Cologne was off my radar until only recently, when I acquired the limited edition purse spray set of their first seven creations (available only at Sephora) and then was sent samples of both VETIVER FATAL and ROSE ANONYME by the house itself the very same week. I believe that I received the samples for signing up at Cafleurebon in response to a feature on this house. In any case, the stars all aligned now, shining down upon me with a bright clarion message: Clearly, it's time to give this house's wares a sniff, and now more than ever, given that a few reviewers have compared VETIVER FATAL to Byredo BAL D'AFRIQUE, which I only just tested today. The moment I donned VETIVER FATAL, I was impressed. It smells very natural and with the perfect amount of vetiver mixed in with a variety of other notes, none of which appears to be iso-E-super! Miracle of all miracles. Or is it that most current men's fragrances contain so much iso-E-super, that my poor nose is unable to discern anything else? All I know is that, if there are such aromachemicals in this composition (and I presume that there are...), they are applied judiciously with the result that it comes off smelling much better than most of the men's colognes I've smelled of late. I prefer VETIVER FATAL to both BAL D'AFRIQUE and Hermessence VETIVER TONKA because it is a touch less sweet and has a bit more vetiver. This creation really seems like vetiver is the centerpiece, although calling it "fatal" is probably going too far. It's definitely not vetiver overkill. No, it's just the right amount of vetiver and one step back from BAL D'AFRIQUE and VETIVER TONKA in sweetness, bringing it a smidgeon closer to (though still at a distance from) Prada INFUSION DE VETIVER. I honestly believe that all of these vetiver creations are 100% unisex and should be marketed as such. This does not smell masculine to me at all--it just smells very good. Yum. I could see buying the large bottle of this one. I was wondering why the fragrances of this house, strangely named Atelier Cologne--with all that that implies--appear to come in only two sizes: 30 ml or 200 ml. This is the sort of fragrance which I could see myself applying quite liberally, so the 30 ml bottle would not be a good idea in my case. Maybe those little bottles exist as extended testers? Well, in any case I am now very interested in working through my purse sprays of the original seven fragrances from this house. If the quality is this high, I'll be adding some of these to my collection at some point. In fact, VETIVER FATAL is already on my wish list. Bravo! Write the first Review for Vétiver Fatal!